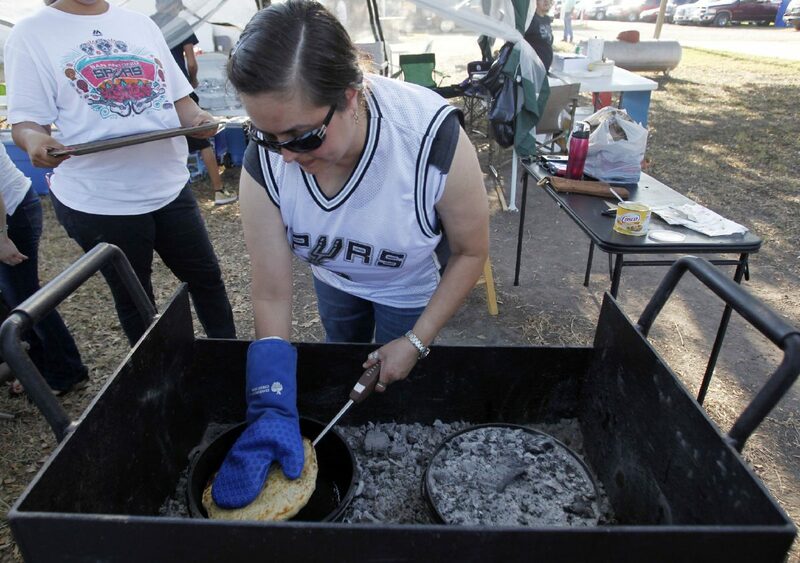 Dahlia Morin flips bread in the Dutch Oven during the Pan de Campo Cook-off at Freddy Gonzalez American Legion Post 408 on Saturday Sept. 23, 2017 in Edinburg. 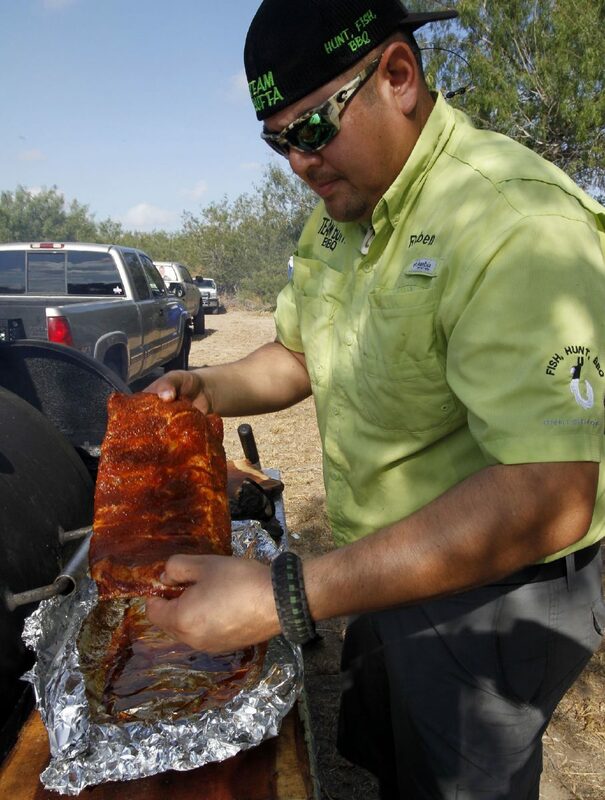 EDINBURG – Giving back to the community with the deliciousness of barbecue was on the menu for the 39th Annual Pan De Campo Cook-off on Saturday at American Legion Post 408. Usually held in January, the free event was changed this year to September. The day brought out area veterans’ to gather and speak about old times and raise funds at the same time. This year’s cook-off featured approximately 17 cooking teams. The contestants included several politicians including Edinburg Mayor Richard Garcia, Hidalgo County District Attorney Ricardo Rodriguez along with several others. As the opening ceremonies wrapped up, the sizzle of the barbecue pit and the aroma of pan de campo, fajitas, carne guisada, charro beans and pork ribs began streaming throughout the outdoor space. Ruben Ramirez Jr. team Buffa shows off the spare ribs during the Pan de Campo Cook-off at Freddy Gonzalez American Legion Post 408 on Saturday Sept. 23, 2017 in Edinburg. 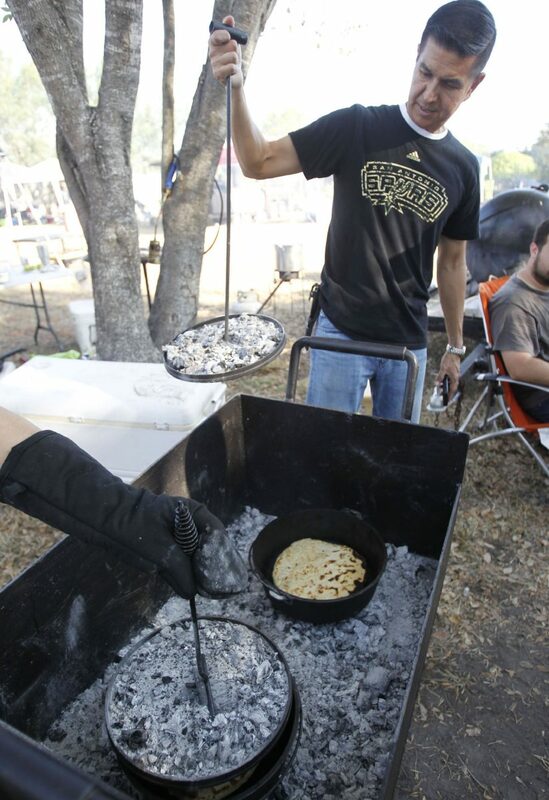 Arnold Morin removes the top of a Dutch Oven during the Pan de Campo Cook-off at Freddy Gonzalez American Legion Post 408 Saturday Sept.23,2017 in Edinburg . 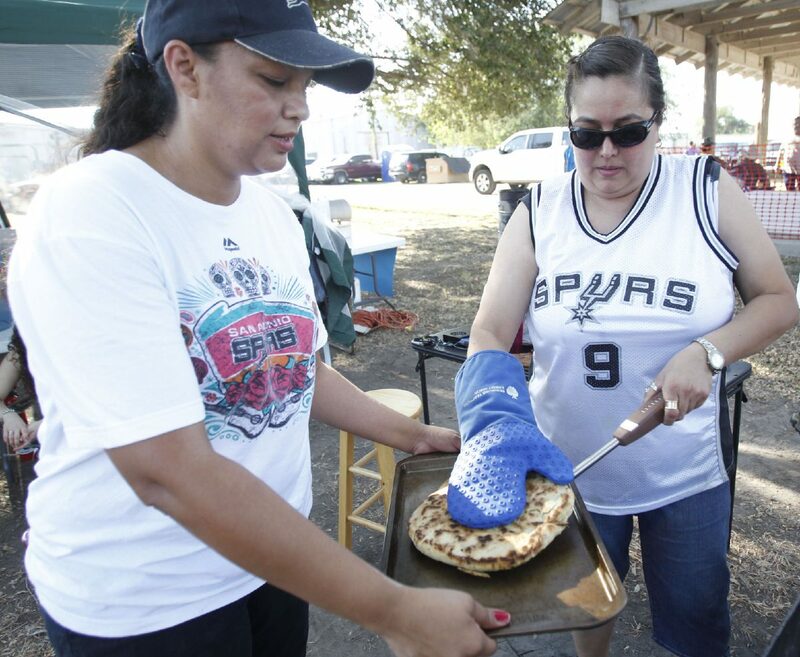 Norma and Dahlia Morin take out a bread during the Pan de Campo Cook-off at Freddy Gonzalez American Legion Post 408 on Saturday Sept. 23, 2017 in Edinburg. Augustin “Gus” Garcia, commander of American Legion Post 408, said the cook-off is a fundraiser for projects the post sponsors such as Boys State, an annual Legion-sponsored leadership event for high school students. The cook-off also helps fund the American Legion baseball program, local high school ROTC programs, the yearly Veteran’s Parade, Easter baskets for children at Edinburg Children’s Hospital along with other veteran’s functions. “We also hold veteran forums, answer any questions for veterans that may want to apply for disability and/or medical help,” Garcia said about what the Legion’s mission. The Edinburg American Legion Post 408 is named after a recipient of the Congressional Medal of Honor, Alfredo “Freddy” Gonzalez. “Edinburg is the only city in Texas that has two recipients of the Congressional Medal of Honor — Alfredo “Freddy” Gonzalez and Pedro Cano,” Garcia added. As the cooking continued outside, there were six judges waiting inside the hall to sample and rate the fajitas, carne guisada, charro beans and pork ribs and choose a winner. Arnoldo Morin, who was handling the entry fees, spoke of his time in Vietnam in the 1960s and how he has been finance officer for Post 408 for approximately 40 years. 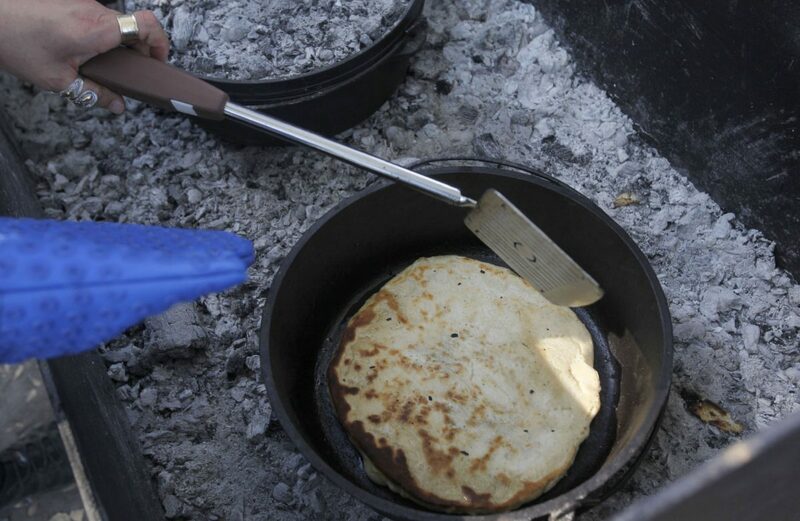 The Morin family has been spearheading the Pan De Campo Cook-off for almost a decade now. Estela, Arnoldo’s wife, was managing the samples while their children, their spouses and grandchildren all took part in the preparations and cooking. Sandra Morin, Arnoldo’s daughter-in-law, and Norma Morin were both preparing the pan de campo dough before the cooking began. “We do it to help out the American Legion,” Sandra and Norma both said. The tradition began in the 1970s with Dr. Thomas Esparza, who was a professor at the then Pan American University. It has since become a popular annual event in the community.